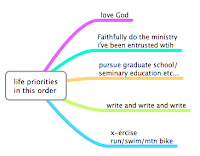 Sometimes I feel like I'm not clear enough on what my priorities are. So I wrote them out quickly to order them and remind myself what's important. It's encouraging to see the things that excite me.